Resembles C. furcata (described elsewhere) but is less tufted, more slender, and has paler green, peeling stems (podetia). The tips of the stems must be closely observed for these have a tendency to become coarse with soredia. Peaty moorlands and mountains. Local, throughout Ireland. Not a sward former like C. furcata, often occurring as a few stems only; local in distribution. Simms, M. J., (2016). 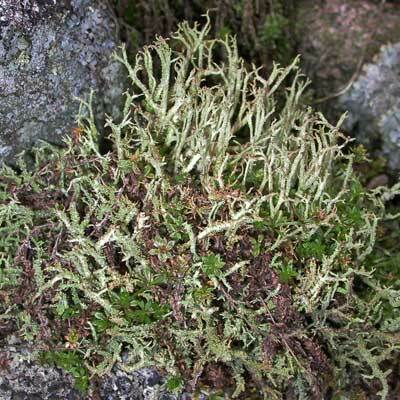 Cladonia scabriuscula (Delise) Nyl.. [In] LichenIreland.